Scientists are increasingly paying attention to the role of clouds in climate change (note 1). The mysterious fluffy companions of the sky still hold a lot of secrets to uncover. They also trigger people all over the world to take cloud pictures and deliver them at the desk of the daily weather forecast on TV, hoping their picture will be shown full-screen in the prime-time weather report. Clouds are of infinite inspiration for scientists, artists and daydreamers. 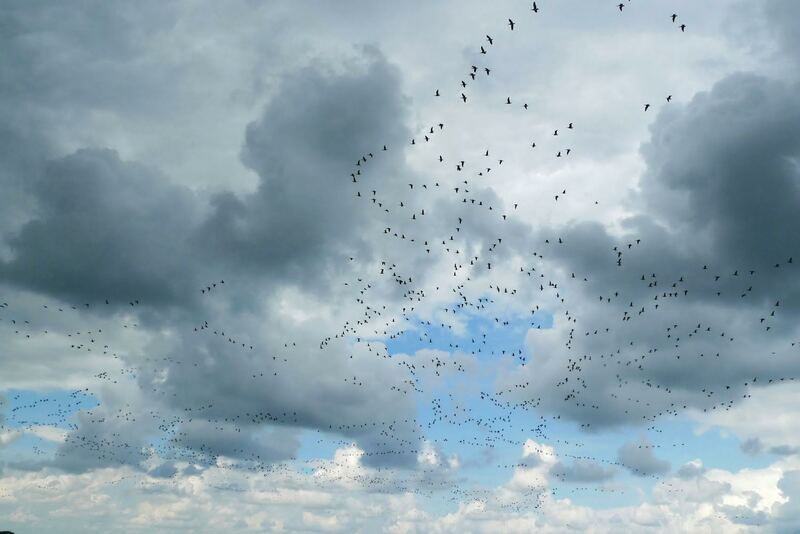 In this article I describe three coherent proposals to form one project ‘CloudWatch’. The project brings together the urgency of climate change and the pure joy of cloud spotting. First, I propose the start of a transnational Cloud Reserve. Second, I proclaim the start of a yearly International Cloud Spotting Day. 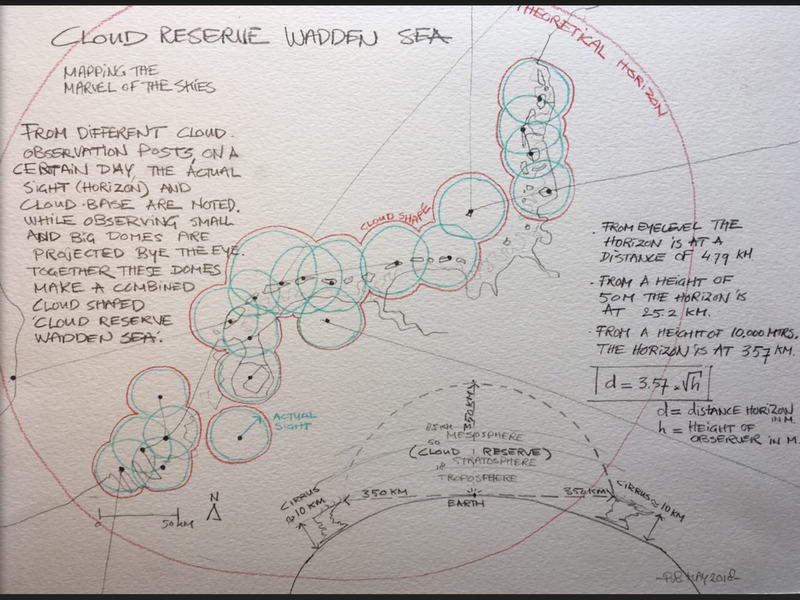 Third, I challenge designers to map and design observation posts to experience the Cloud Reserve from the ground. The history of the cloudy sky starts with the proto-scientific farm wisdom and the sailor’s gaze. Later astronomers and geographers followed. They forged measuring instruments and started gathering information. With a now ‘professional gaze’ they watched the skies. In the 17th century painters discovered the sky as a subject. Think of Ruisdael (Rijksmuseum Amsterdam) or Turner (Tate Britain). Thanks to the portable paint tube, painters could work outside. Their field work lead eventually to Impressionism, a style necessary to paint the ever-changing atmosphere. The knowledge of clouds was extended by the 19th century Dutch painters of the light of the Haagse School. Forever they connect the iconic Dutch skies with the flat countries’ and marine horizons. These paintings awake a modern visual appreciation of the horizon, where cloud spotting, wave spotting and panoramic landscape spotting meet. Accompanied by brand-new disciplines like meteorology, ornithology and by the first aeronauts, mankind explored the airspace in the 20th century in transnational societies. From the military and civil aviation and weather institutes, the now aged shipping forecasts by radio, through current climate research, the knowledge of air becomes more sophisticated and deeper. And now, the daily weather forecast with a line-up of cloud snapshots offers a rich substrate for our project CloudWatch. The urgency for this project is climate change. It is very important to educate ourselves and especially younger people with basic knowledge of the weather. This is because ‘climate’ is a long term and large scale subject. It is not really suitable for the direct human experience. It acts as a ‘hyperobject’ as philosopher Timothy Morton says (note 2). The daily weather experience is the way we relate ourselves to this long term, big scale climate. ‘Weather’ is not the same as ‘climate’, but coping with the daily weather is a cultural way to relate ourselves to ‘climate’ (note 3). And only if we understand and are familiar to weather events we can develop a kind of understanding of climate change. On the other hand the CloudWatch project descents from the joy of cloudspotting. Although you can spot clouds from nearly anywhere outside, wouldn´t it be great to have a place where you can find all the cloud species and nice observation posts to look up the sky? Therefore CloudWatch is a proposal for a virtual Cloud Reserve. A space as refugium like a Krügerpark or UNESCO Serengetipark, where all sorts of clouds can be cherished and will be protected from pollution or visual disturbances. Where they even can find shelter from future evil climate engineers. To create such a Cloud Reserve, we must define a specific part of the airspace where man can experience the phenomenon. To give enough clouds the opportunity to drift across the Cloud Reserve must be a large area that possibly covers several countries – so it might actually be a Transnational Cloud Reserve. Here we welcome all wonderful cloud families, first named by the British chemist Luke Howard in 1803 (note 4) and nowadays described in the International Cloud Atlas. The Cloud Reserve is not intended as museum. It must be a dynamic testing ground for education, science and culture. A workspace also to considerately ‘cultivate the sky’. Together with this Cloud Reserve, I also want to proclaim an International Cloud Spotting Day. Is there a better date than March 21? It is the beginning of spring in the northern hemisphere, a very fine time of year to watch clouds. But the 21st of March is also the date that Luke Howard – inventor of the clouds – passed away in 1864. The Cloud Reserve and the International Cloud Spotting Day could be a just tribute to this curious man. As a simple chemist he invented a systematic language to catch the modulations of clouds. He handed us the ABC of cloud spotting: Cirrus, cumulus, stratus and therefore he deserves a special day. A day to watch clouds, maybe in a Cloud Reserve. d = 3,57* √h. Where d is the maximum visual distance and h is the eye level (note 5). This means that the Cloud Reserve will be a circle with radius 357 km. Now the final question remains. Where should the centre point of this circular Cloud Reserve be located? I challenge everyone to think of a good spot. Let it be a public debate. I think it might best be a location close by the cloud producing sea. Maybe Helgoland, or Terschelling, Valetta, or..? As inhabitant of The Netherlands, famous for their skies, I would say: why not in Holland? James Turrells Celestial Vault is a good place to start. 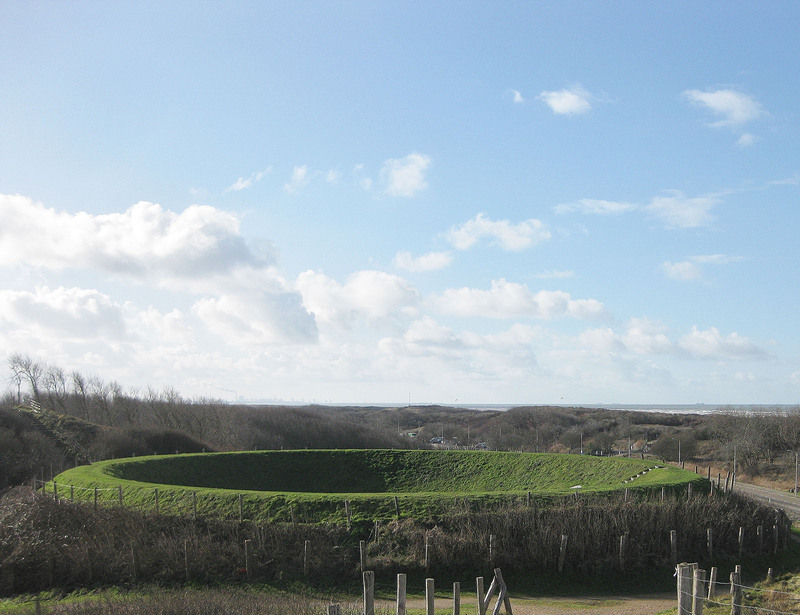 In this smooth man-made crater amidst the dunes of The Hague you can lie down on a chair and see a marvel. Looking up you will see the sky overhead like a bowl placed on the sharply carved horizon. For this land-art project Turrell was inspired by the Dutch physicist Marcel Minnaert (note 6). It is a perfect example of a project we need to experience the Cloud Reserve. It gives us the ability to look up and see more than just blue skies or even just clouds. It was not a coincidence Turrell chose Holland for this piece of art. 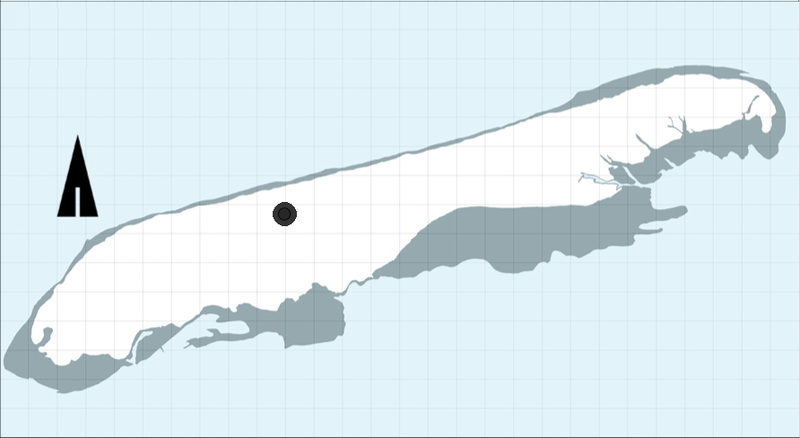 This country close to the sea is famous for its Dutch atmosphere, towering clouds and famous Dutch light. Another artist, Anish Kapoor, placed one of his beautiful Sky Mirrors in Tilburg in The Netherlands. Therefore it seems reasonable that the sky filled by the Dutch Light (note 7) is the next and ultimate Dutch UNESCO World Heritage and must be part of the transnational Cloud Reserve. In a country like the Netherlands, where people live with four-seasons-in-one-day and typical Dutch skies, one would expect nothing less than an ‘atmospheric philosophy of life’, handed down from generation to generation. But strangely, there seems no such awareness. OK, the weather plays a significant role in the daily chitchat. The neutral subject of the weather acts as a vehicle in social talk. But most people lack real interest and overlook the rich vocabulary that is at hand. Only a few people are employed to watch the sky with bare eyes and well trained eyes. But even today, there still is a large group of meteorologists, bird and plane spotters, storm chasers, sailors, pilots and artists who look up to the sky. The project CloudWatch participates in this everyday play. In my opinion the Cloud Reserve is a perfect place to experience the joy of cloud spotting. The viewpoint, direction and method of watching the skies is important in training the eye. To tell altostratus from cirrocumulus, or altostratus undulatus asperitas from mammatus. But certainly, also our cultural preoccupation and ideas give color to what we actually see. Likewise, in this perspective it even is of our interest what people see in clouds. For instance, do we see faces, cartoon figures, things or giants? Could it be that above the coastline, clouds tend to form sea animals and in the hinterland land animals? And if we tag those cloudy animals, what will they ‘see’ on their way? It is worth a scientific investigation, don’t you think? To carry out such an investigation, we need observation posts. Now that brings us to the third point: how to give shape on the ground to the virtual reserve in the air? Inspiration comes from the former British Royal Observers Corps. A civil organization of volunteers lead by a military division. Main goal: to observe the skies day and night on the lookout for foreign aircrafts. In Holland, from 1950 to 1968 there was a similar service, the Korps Luchtwachtdienst (KLD). In the Cold War, 5.200 trained volunteers guarded the Dutch airspace. From 276 carefully chosen observation posts, sky watchers observed the sky 24/7 to detect foreign airplanes. If necessary they alarmed the headquarters. These posts were situated at places higher than their surrounding area, like hills, mills, church towers, dikes. This network was completed by 138 specially built concrete Watchtowers. In the 18 years of watching the skies, only one unknown Russian aircraft was spotted. At the end it appeared that this plane was only attending a flight show (note 8). Probably most of the time the Dutch Sky watchers must have seen only the cloud species of the International Cloud Atlas. The CloudWatch project is a plea to map and describe all existing sky observation posts in Europe, but also to design new ones (as landscape architect I’d love to design one). And eventually, to build a network of places of interest and observation to experience something like an transnational Cloud Reserve. A vast space, where the sky is surveyed as a common good. I hope to meet you there on March 21. 3 – Strauss, S. (ed.) and B. S. Orlove (ed. ), Weather, Climate, Culture, Berg Publishers, 2003.